The Color Run Malaysia 2017 | JustRunLah! 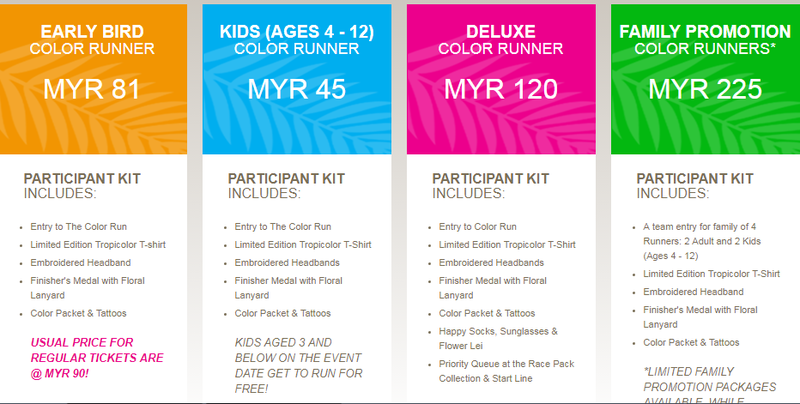 Taking place for the second time in Kuala Lumpur at Padang Merbok on 13 August, the 2017 “Tropicolor” edition will see some 13,000 participants dash through a series of brilliantly coloured zones based on a tropical theme, characterised by tropical arches, palm trees, island-style music, and even a 'beach'. Participants will experience an all-new Tropicolor Zone™ on course, where they will be bathed in a tropical array of colors as they pass through the shade of palm trees, arches, and island-style music. At the Finish Festival, Color Runners will enjoy even more fun at Rainbow Beach, an interactive island featuring music, dancing, unique photo opportunities, and massive color throws. Each Color Runner will also receive a limited-edition Tropicolor race shirt, finisher’s medal on a floral-printed ribbon, embroidered headband, and fun temporary tattoos. It doesn’t matter if it’s your first experience with The Color Run or you’ve been joining in for years, the Tropicolor World Tour will be the most memorable 5 km of your life.